The key evidence repeatedly brought up at the trial was the $14,600 in ransom money that was found in Hauptmann's garage. Hauptmann may have told the truth with "The Fisch Story;" However, Fisch was dead and $30,000 of the ransom money has yet to be found. And, what happened to J.J. Faulkner? Before Hauptmann's execution Harold Hoffman, New Jersey's Governor, received a letter from someone claiming to be J.J. Faulkner who said they had arrested the wrong guy. The second piece of evidence was found at the site of the crime. It was a 3/4" chisel. When the police searched Hauptmann's toolbox, they said he had no 3/4" chisel. The Prosecution argued that every carpenter would need this type of chisel because it is a standard tool. Later, forty years to be exact, Anthony Scaduto, a crime reporter, investigated this piece of evidence and found not only the chisel from the crime scene, but also two others wrapped in a brown bag labeled "Found in Hauptmann's garage." Scaduto wrote "Scapegoat." based upon his research in which he reveals the shocking truth - the prosecution framed Hauptmann. the Mt. Rose road near which the child's body was found." sure the baby that was found was taken out of this hole". said that sheets were taken from his house and cut in strips"
home had been broken open and a New Jersey State Police was stationed there". and if he were given a chance he would be able to identify them". near the Lindbergh home following the crime". Two witnesses stating they saw Hauptmann near the Lindbergh home the day of the crime also caused the jury to vote guilty. One of the witnesses, a foreman from the Majestic Corp., the same place Hauptmann claimed he was employed at the time, uncovered a time card that proved Hauptmann did not work the day of the kidnapping. 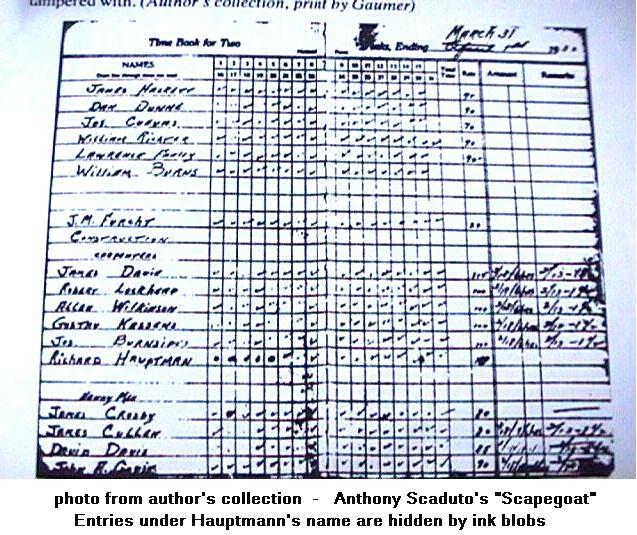 However, the time card was most certainly tampered with because of differences between Hauptmann's and that of others who did not work on March 1, 1932. Hauptmann's record was the only one marked up with big blobs of ink! The other laborers had a line of zeros or checks - no blobs of ink anywhere except through Hauptmann's time line. The prosecution had no shame. They brought in a "witness" who was legally blind. When he came to collect his share of the reward money from Gov. Hoffman, after Hauptmann's electrocution, he mistook a vase of flowers for a woman's hat in the Governor's office. Yet he claimed to be able to identify a man driving a vehicle - a man he suddenly remembered seeing after Hauptmann had been arrested over 2 years later. The truth was that he told police, the night of the "kidnapping," he had seen nothing. This fact was never revealed at the trial. No discovery laws in 1935. The police lineup in which the witnesses pointed out Hauptmann was also a mockery of the judicial system. The line-up consisted of Hauptmann accompanied by an Irish detective, a policeman in uniform, and a blond. The only person who came close to fitting the description of John was Hauptmann. Another piece of evidence which convicted Hauptmann was the positive identification of Hauptmann in court by Dr. Condon. Prior to the trial, Dr. Condon refused to make a positive identification because he did not believe that Hauptmann was the man he met in the cemetery. 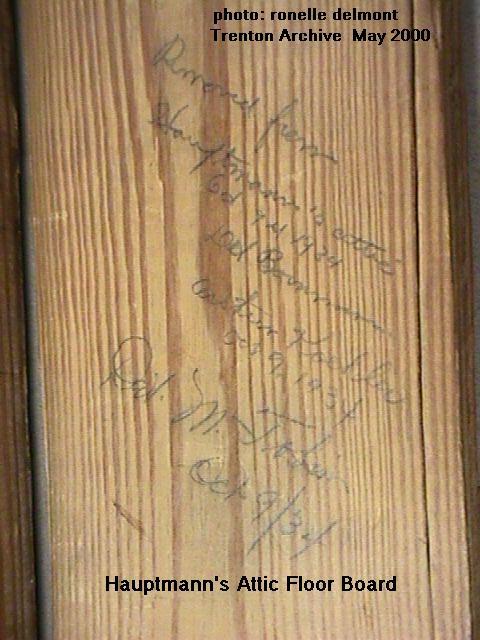 Another key piece of evidence submitted in court was a board from Hauptmann's closet. Scribbled on the board was Dr. Condon's phone number. Hauptmann said he did not remember writing the number; however, he may have since he had an interest in the case. Later, a reporter from The New York Daily News bragged to other reporters that he wrote the number there himself because his editors were pressuring him for more "front page material." This is believable since Hauptmann had no phone and if he was using a pay phone to call Dr. Condon, he would write the number on something easier to carry. Another strange fact is that one had to remove both shelves in the closet and stand in the back with a flashlight to even see the number. Why would someone write a number in such a difficult place? Lt Bornmann of the Jersey Police moved into Hauptmann's house after he was arrested and refused to allow the defense team into the house! All alone in Hauptmann's attic, Bornmann claimed to have found a floor board missing even though the FBI and NYC Police had gone over that attic a number of times. 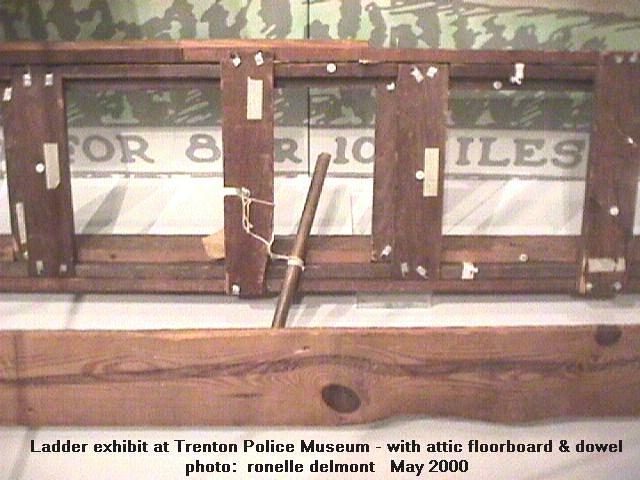 The missing board in Hauptmann's attic was also a key factor in the jury voting guilty since Wilentz claimed it matched the wood of the "kidnap" ladder. However, when the wood was matched with that of the wood in the Hauptmann attic, the piece from the ladder was thicker than that of the attic floor. The Governor of New Jersey, Harold Hoffman, openly stated the evidence was false when he discovered this information. Read excerpts from Lt. Bornmann's testimony at Hauptmann's trial. Now there is a DNA test that can be done to determine if both pieces actually came from the same tree. This is the single most important piece of "evidence" that can now exonerate the German immigrant. But the most outrageous evidence against Hauptmann was Lindbergh's identification of Hauptmann's voice as cemetery John's. Lindbergh was a national hero- a man everyone would believe. However, he heard the voice more than two years prior to the trial, from a distance of several hundred feet. Since police records show that Lindbergh never gave consistent descriptions of what he actually heard "John" shout (while he sat in the car with the windows rolled up) how did that jury ever believe him? It is not humanly possible to recognize any voice two and one half years later even if you are at close range - but to pick out a man whom you have never met or even seen? The adoration of the jury is the only explanation for this travesty - they simply wanted to please the hero and burn the carpenter. Earwitness accounts in trials are likely to be highly unreliable and should be treated with extreme caution by juries, a major science conference in America has been told. Although there are few cases that have hung on what a witness may or may not have heard, there have been some famous examples where voice as opposed to visual identification has formed crucial evidence. Perhaps the most famous was the Lindbergh murder trial in the 1930s, in which Bruno Hauptmann was sentenced to death after a witness claimed the defendant's voice was the same one heard shouting "Hey Doc - over here" in a cemetery 33 months previously. Larry Solan, from the Brooklyn Law School, told the American Association for the Advancement of Science that such earwitness accounts should be given short shrift by the judicial system - but, sadly, they were not. "The law assumes that once someone has heard a voice, they can recall that voice and report it accurately," he said. "Research has shown that that is not the case. "The reliability of earwitness accounts differs under the circumstances. We are quite good at recognizing voices that we're very familiar with and very bad at recognizing voices with which we're only slightly familiar or unfamiliar and have heard only once. "And yet, the law does not make the distinctions among these different circumstances." Studies have shown that people vary in their abilities to recognize voices. Young adults are better at it than young children and old people. We also have difficulty recognizing a voice if it is speaking with a foreign accent or is whispering. Stressed voices can sound very different, and the number of exposures to a voice and the time since it was last heard also have a crucial bearing on recognition. "Not only are we not good at identifying voices, but we think we're much better at it than we are," said Professor Solan. "So when we are on jury duty and we are listening to a trial and somebody says, 'Yes, the voice that I heard 11 months ago is the voice of the defendant', we will tend to overestimate the accuracy of that identification." Professor Solan said the courts in the US had ignored the work of many linguists and psychologists. He said the system of "minimal familiarity" which meant juries were simply presented with evidence and asked to weigh its importance was flawed because the studies had shown juries gave earwitness accounts undue weight. "It's time the judicial system sat up and took notice and started listening to what the linguists and psychologists have found." Reeve Lindbergh has written a new memoir, Under A Wing: A Memoir in which she claims the reason her father was so intolerant of his children was because he was really hard of hearing and would never admit such a thing to anyone! Well, was the Lone Eagle a Deaf Eagle? Did he hear anything at all that night at the cemetery or did he make it all up according to Condon's story? Condon changed his description of what he heard Cemetery John shout also. Many times. So what did Lindbergh actually hear? The excuse being made, to this day, by Police apologists, is that Lindbergh wanted to spare his wife from the torment of the trial! It is not possible for this testimony to be accurate. It is based on 2 words shouted almost 3 years earlier. Yet most people resorted to irrational thinking even though a man's life was in the balance. Most people would be more skeptical if the witness, Charles Lindbergh, was selling them a used car! Evidently, a man was put to death, the lives of a woman and her young child destroyed - because of a need to please a hero. One piece of evidence that should have been used in court was a plaster foot mold of John's footprint. The mold was made by Ralph Hacker, Dr. Condon's son-in-law,. It was found at the base of the cemetery wall that "John" jumped over. Hacker made a plaster mold of the footprint left by the extortionist in the cemetery. None of Hauptmann's shoes ever fit that mold just as none of Hauptmann's fingerprints were ever found anywhere in New Jersey. This mold is not in any archive and appears to be "lost." Hauptmann : Lucifer or Scapegoat? 1.) Police found fingerprints on the kidnap ladder and on four of the ransom notes. Not ONE of these matched Hauptmann's fingerprints, and most remain completely unidentified to this day. 2. )The plaster cast of Cemetery John's shoeprint made by BI agent Sisk was to small to have been made by Hauptmann's foot. 3. )The prosecution's handwriting experts all admitted, under direct and cross examination that there were many differences between the ransom note handwriting and Hauptmann's conceded writings. They attributed this to the defendant using a "disguised handwriting". 4. )Fingerprint expert Dr. Hudson testified at the trial that there was only one nail hole in Rail 16 when he examined it on March 13, 1932, and after the trial Gov. Hoffman produced a March 2, 1932 photograph of rail 16 with no nail holes in it. 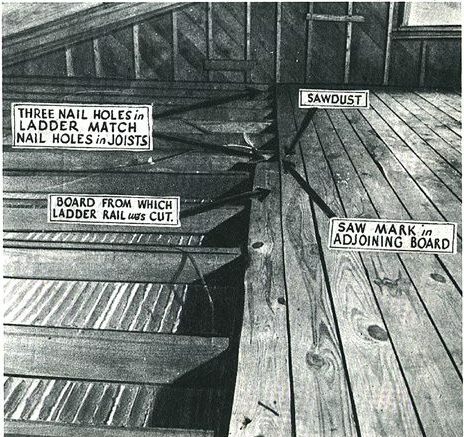 Without these holes, there could be no link between rail 16 and the nail holes in the joists in the defendant's attic. 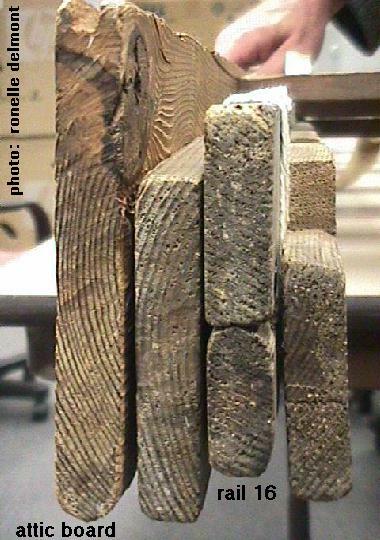 The half board in the defendants attic that rail 16 supposedly came from had seven knots in it whereas rail 16 had only three knots. 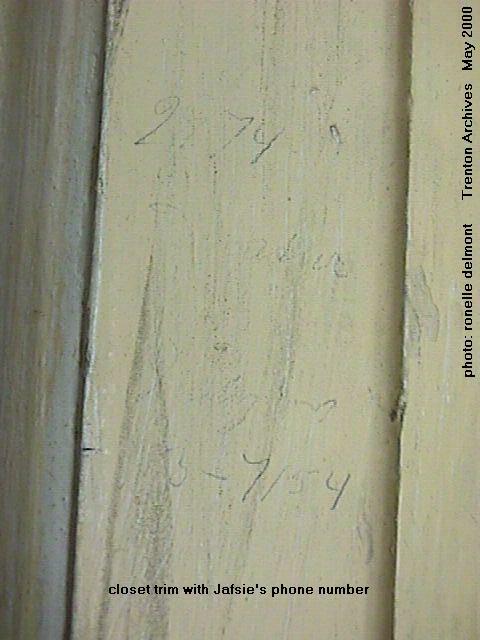 Moreover, the planed rail 16 was actually one-sixteenth of an inch THICKER than the unplaned attic board, making a match between the two extremely unlikely. 5. )The two eyewitnesses who identified Hauptmann as being Cemetery John both identified men who looked nothing like Hauptmann as being John prior to the defendant's arrest. The two eyewitnesses who identified Hauptmann as a man lurking near the Lindbergh estate at the time of the kidnapping had both told police previously that they had not seen any suspicious characters that day. 6. )A newsman, Tom Cassidy, publicly boasted of having written Dr. Condon's name address and phone number on a board in Hauptmann's closet. Kidnapping March 1st - Money delivered April 2nd. It was Hauptmann's position when arrested, that he worked on 3-1-32. According the supervisor of construction, Joe Furcht, as well as employment agent E.V. Pescia, Hauptmann worked a full day 3-1-32. Furcht made a sworn statement to this fact and attached a copy of the pay sheet to it. 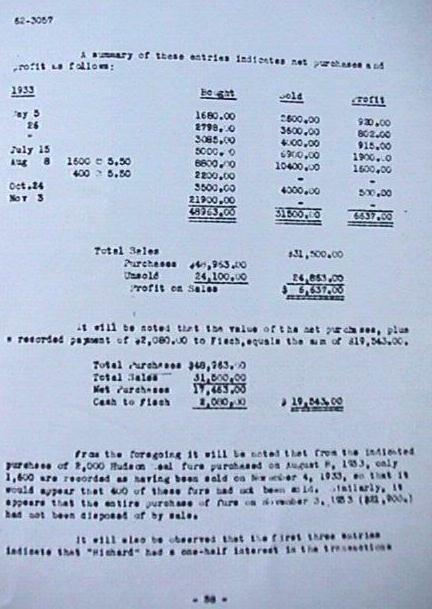 Of course this pay sheet vanishes after being turned over to Inspector Harry Walsh. The records that were not missing were clearly tampered with as indicated by Kennedy and Scaduto. Both the time book and the payroll time record shown in Kennedy are clearly altered. You can't look at them and tell me they aren't. Howard Knapp, assistant treasurer for Reliance Property Management, testified at the Bronx hearing testified that the records for March 1st to 15th "do not exist". The above records are property of the Majestic Apartments, 72nd St. and Central Park, West, New York City. Scaduto quotes a Times article quoting Foley as saying: "...the employment records showed that Hauptmann quit work at the Majestic at 1p.m. the day of the kidnapping". And quoted Wilentz as saying: "The police know definitely that Hauptmann did not work those hours, nor did he put in a full day of work on March first..." (page 282). Thereby proving their knowledge of records that Knapp had testified "did not exist". Q: On April 2nd, 1932 tell me whether or not Bruno Richard Hauptmann worked. A: No, sir; Bruno Richard Hauptmann did not work on April 2nd, 1932. Q: Then you have a check that he (Hauptmann) worked on the 3rd and 4th, haven't you A: Yes, sir. Q: What day was Sunday? A: April 3rd. Q: Did any carpenters work on Sunday? A: No. Q: 26th. Now, every one of the carpenters on the 26th of March, which you claim was a Sunday, have check marks opposite their names just as though they worked, haven't they? A: Yes, sir. Q: And April 2nd, carpenters, you have an "O," is that right? A: For the carpenters. Q: Yes, a naught for Hauptmann? A: Yes, sir. Q: But you have a check marked the next day, April 3rd, haven't you? A: Yes, sir. Q: He didn't work that day, did he? A: No, sir; he didn't. Q: Then you don't keep your books accurate, do you? A: Yes, sir. Q: You think that is accuracy, do you? As a retired NYC police officer, currently employed as a medicolegal forensic investigator for the NYC Medical Examiner's Officer, I have always been fascinated by the Lindbergh kidnapping case.. My original impression was after some reading that Hauptmann was involved in the kidnapping, that he killed the infant, or was involved with the person that did, and that he was caught with the Ranson money. WHAT ELSE COULD ONE ASK IF YOU WANT TO CONVICT A PERSON. IT WAS CERTAINLY A PROSECUTORS DREAM. However, the more I read the more it became obvious that nothing made sense. Reading of the trial transcript revealed that all of Hauptmann's witness were totally destroyed on the witness stand (abridged version). No crime nor no prosection is every perfect. The more perfect the prosecution and testimony the more suspect it becomes. Then it came to me after doing some more research: (1) Obviously we must have had the best police department in the world whose skills at obtaining evidence and testimony bordered on unbelief, and/or (2) evidence was being manufactured, suppressed or altered, and witnesses were being threatened or change they testimony. As a former police officer I know very well how things are manufactured and presented. To frequently the bounds of legality and morality are overstepped in an effort to convict a person. However, I believe that even by the 1930 standards these practices were totally immoral, illegal and unethical. What disturbs me even more so than the likes of Wilentz, et al, is the stonewalling of the authorities in New Jersey today. There was a saying by Cardinal Reicheliu that " the law in majestic equality forbids both rich and poor men to sleep under the same bridge." They are afraid of what new DNA forensic test will indicate. If they had any certitude about the GUILT of Hauptmann they would have jumped at the change. They are simply afraid to admit the TRUTH - and that is that Hauptmann was innocent. I'm sorry for rambling on but I had to tell you about how I feel. I would like to commend you for your dedicating in shinning truth on a very difficult subject, when there are still people out there with a closed and biased minds, along with people unwilling to look for the truth even when it strikes them in the face. Below is an attempt at setting forth the few known facts about the table and ransom note symbol. I was wondering if you guys would be kind enough to post this for me. I've been giving lectures here at work to several school groups and their questions are focusing a lot on the mysterious table. I was caught off guard by this sudden interest and it was explained that there's a lot of activity on the internet right now about it. I guess as they prepared for the trip they were reading your sites. A couple of callers asked me about the "Hand of Hauptmann" influence on the confession because the book was published in the discoverer's neighborhood. Unfortunately this, too, is wrong. 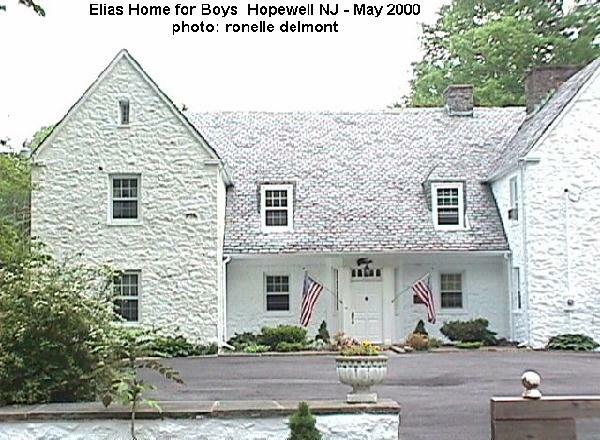 The Hamer Publishing Company was located in Plainfield, New Jersey, 4.5 miles away from South Plainfield where the table was actually discovered. Also, the book was published in 1937, and not 1948 as the caller had been led to believe. That is over a decade prior to the alleged discovery and there is no evidence known to the Museum staff that Haring was distributing his book there eleven years after its publication. The handwriting is not German handwriting. There are mistakes in the message that a native German speaker would not make. However, there is an aspect to the message that most likely only someone native to German culture would know to use - the song lyrics. The introduction, the confession, the ransom location and the signature. The introduction is taken from an old German "sailor's song", a rather risque song. It was not known that this was actually a song until a German friend of mine recognized it. This is, obviously, the German initials of the Nazi Party. Regarding the holes in the table and in the ransom notes: The holes in the table are considered to be original to the table. All of the ransom notes with the symbol, when laid on top of the center three holes, line up perfectly. When laid on top of one another they line up perfectly as well. A recent study (unpublished) was done of the ransom note holes and it has been determined that they were not all punched at the same time. Rather, groups of two or three (roughly) were most likely punched at once. This was actually determined back in 1932 by Russell Snook and has been known to scholars of the case for several years now. 3. Holes not all made at same time. 4. Symbol indicates sense of balance, symetry [sic] and beauty. That further examination be made to determine how symbol was made." "Examination was also made of the secret symbol on the ransom notes. After considerable experimentation both Dr. Souder and Mr. Davis stated it was their opinion that the large circles in the symbol were made by the top of a cork of a black ink bottle (probably a Waterman's) and the smaller red circle by the bottom of a cork of a red ink bottle. Mr. Davis duplicated the large circles with a cork from a Waterman's ink bottle. It was thought that the holes in the paper were made by some blunt instrument punched through the paper using something under the paper as a guage [sic], such as a hole in a belt a shoe or some other ordinary article which would least attract attention. It was found there is a variation in the holes in the notes which indicates that the papers were not all punched at the same time." Lastly, there are no police reports that I am aware of in existence today concerning the table. The South Plainfield police had destroyed their records and a retired officer who was on duty in 1948 did not remember the table nor the alleged hoax. Additionally, there have been no State Police records found concerning the table. Personally, I do not know if the message on the board is a hoax or not. I do believe it to be a very compelling mystery. While the table message was declared a hoax in 1948, it was declared so based (as far as we can tell) on the handwriting. It does not match anyone's from the case as far as we can determine. However, the holes were not examined (at least, we do not believe so - there are no police reports, remember). This is based on conversations with Troopers who told me that had the discovery that I made a couple years ago been made in 1948, it would not have been dismissed as quickly as it apparently was. Therefore, my official stance is that I have no idea if it is a hoax; I have no idea what the whole thing means. But it is also my belief that it should not be dismissed outright, especially by people who are not in possession of accurate information. I should also point out that only a couple people have actually come to the Museum to do a thorough "examination" and research into this item, and from the printouts I have been given by the students, I see that they are not the ones posting information about the table. So, please be aware of this. I hope this helps to clarify the confusion and speculation about the table. And I hope it spurs more research from all sides! I know from the number of people who ask me questions based upon what they've found on the internet that the websites are attracting a lot of people and are helping to keep this case alive. I regret that I no longer have the time to read the websites like I used to. As you know, it is very rare that I ask for anything to be posted but with the number of questions I've gotten over the past couple of days from students visiting the Museum, I thought I should set the record as straight as it can be set.